In today’s world, everyone is expected to behave or act in a certain way. If they don’t do so, their behavior is regarded as inappropriate and is not approved by the people in the society. In pursuit of meeting other’s expectations of acting in a certain way, one often gets stepped on, criticised, ignored and what not. Still, he/she believes that because their values are greater than that of others and that’s why they continue to do what they do. Though this saddens them deeply, they try to adjust to whatever is happening in their lives. Because of this reason, they are often considered the perfect candidates for better jobs. They can perceive themselves as perfect to a great extent. Although to survive in the current world many times it is necessary to behave appropriately, this attitude rarely has to do with sensitivity. People belonging to certain zodiac signs are more Sensitive than others. Minor inconveniences bother them way too much. 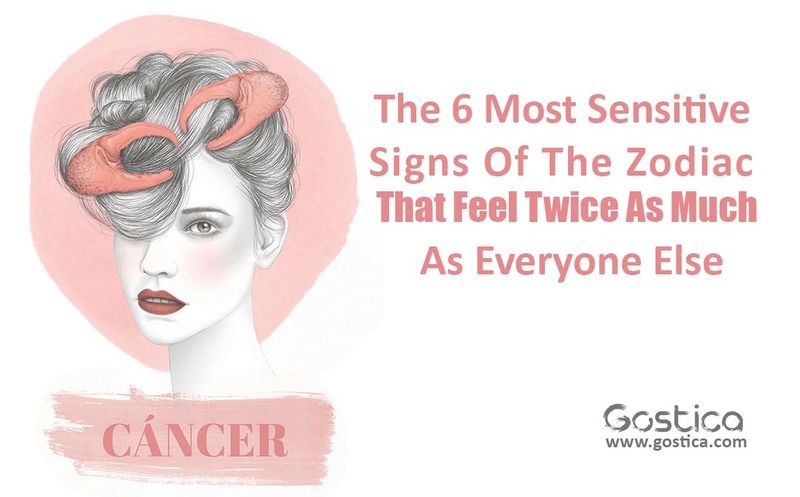 Here is the list of the most sensitive zodiac signs who feel everything twice as much as other people do. But if you ask us, what’s wrong with being sensitive, here is the answer. People who are sensitive are one of the most vulnerable group of people you will ever come across. Being sensitive is necessary but only up to a certain extent. You might think that people are not that sensitive. But, you might be wrong. People often hide their true feelings. They do not prefer to disclose their true nature or true feelings. Read on to find out whether you belong to any of these most sensitive zodiac signs as characterized by astrologers. People who belong to this zodiac sign are considered as the most peaceful, generous and kind-hearted people on the earth. These people feel everything so very deeply. They see relationships as something more than mere physical contact between two people. They see it as a way to connect two souls, to take care of each other’s needs, to protect each other, to make the other feel loved and most importantly, to give your best to the other person. What they want in return is the reciprocation of their love. They wish to receive the same amount of love that they give to others. Recommended: The 3 Zodiac Signs That Are Born To Change The World. Just because these people expect so much in return, they often get hurt. It is a natural human tendency to expect everything that one gives in return. And when they don’t get that love and affection back, they tend to become sad or depressed. The more you think about it, the more hurt you’ll be. When hurt, you tend to share your feelings with the very next person beside you. In this way, you may tell your story to the wrong person. They might not understand your feelings and simply think that you are probably overthinking and exaggerating things. So, don’t expect too much even from your close ones. That is the key to happiness and inner peace. According to Astrologers, If you belong to this zodiac sign, you are characterized as an intense, passionate person who can be considered as a purely physical lover. You are short tempered and often lose it when things don’t go your way. Due to this characteristic, you are usually tagged as aggressive amongst your colleagues. You neither forgive nor forget. You always seek vengeance and never forgive the one who did you wrong. Everything else about is positive except for this quality. Your wish to seek revenge is what hurts you the most. You might have heard people saying that “he who forgives and forgets easily is the happiest of all”. So, try to practice this. One more downside about your personality is that whenever someone hurt your feelings, you tend to react immediately in a negative manner. You are bold, and that shows in the words you choose to speak. Whenever you are hurt, it makes you angry, and the reaction is quick. You never hesitate or think twice before expressing your anger even on the most sensitive or emotional issues. So, try to live by the saying: “No reaction is the best reaction”. If you don’t react at all, other people might think of it as weirdly unusual behavior. They might even realize their mistake without you having to say it. You will be happier that way. Don’t destroy your inner peace and well being because of people. If you belong to this zodiac sign, you are known for helping people out. From your family, friends, acquaintances to a complete stranger it doesn’t matter whom you are helping. You put a lot of effort into advising those who come to you seeking help and congeniality with everyone thanks to your empathy. Even fictional stories (from books, TV, movies) provoke your tears. Art makes you feel safe and allows you to demonstrate the depth and strength of your emotions. If you belong to this zodiac sign, you think way too much about things. You think about petty things which should not affect you in the first place. Apart from thinking about them, you let them affect you. Smallest of things bother you. Whenever you say something to someone, you give much thought to it. You are very careful with your words, and that is the reason why you have a healthy relationship with others. You pay attention to important things, and that is why you don’t have time to concentrate on the not-so-important things in your life. This is one positive thing about you. Stop giving much thought to petty things, and you’ll be much happier that way. If you belong to this zodiac sign, you have the outstanding qualities of being patient, balanced and calm and composed. Whether you act that way, or you are like that, you manage to hide your true emotions behind these positive characteristics. You are a man of your words. Whatever you say, you say it with hundred percent sincerity. Your words and your actions go hand in hand. You are not that kind of a person who says something and does the opposite of it. For instance, you only reveal your feelings when you are hundred percent sure of it. You tell someone that you like them only when you do. Naturally, you expect such kind of behavior in return. And when people say something and do something else, it bothers you. Your emotional and sensitive side comes out when you face problems in your relationships. Have control over your emotions when it comes to relationships. If you belong to this zodiac sign, you do not live in an imaginary world, and you are very realistic and practical. When you feel, you feel with great intensity. You are an extrovert, and you openly express yourself in front of other people. You don’t even mind talking about difficult, delicate or embarrassing topics. When you want to say something, you say it out loud and clear. Also, you do not think much before speaking. You don’t control yourself whenever you are expressing your true feelings. There are no limits to that. Because you put in a lot of efforts to make this world a better place, it breaks your heart to see anything otherwise. That’s when your emotional and sensitive side comes out.